Writer/director John Carney's major film calling card is the 2006 low budget big hit Once about a broken hearted Dublin musician who forms a musical partnership with a Czech woman and songs and potential romance filled the auditoriums. 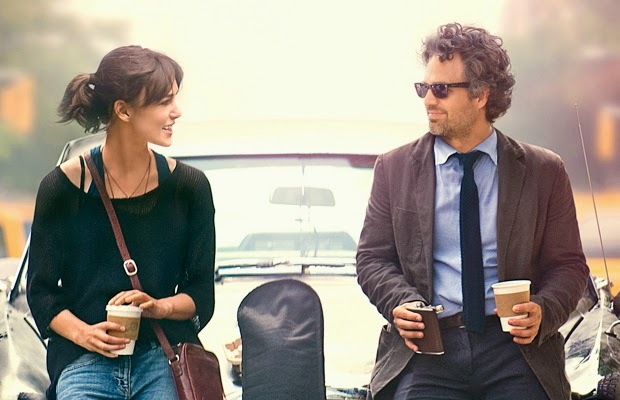 Carney's Begin Again could well be considered a first cousin to Once as we follow the story of Dan (Mark Ruffalo) New York based A&R man once the toast of the industry, now falling on tougher times and trawling through the mountain of new releases earnestly looking for talent. He finds it on one faithful night in the form of English song writer and reluctant singer Greta (Keira Knightley) reeling from her relationship with fellow musician boyfriend Dave (Adam Levine of Maroon 5 fame) currently on a major career upward trajectory. Dan and Greta team up to create a concept album using summer time New York City as their recording studio which also nicely allows Begin Again to enjoy a happy, eclectic New York backdrop. James Corden is Greta's busking friend from home Steve and the motley crew begin to record together. Added to the musical mix is Dan's teenage daughter Violet (Hailee Steinfeld) and estranged music journalist wife Miriam (Catherine Keener). As one might imagine, Begin Again's soundtrack is a lavish affair with all the cast contributing to musical scenes and many an Irish band featured throughout the film. One would be hard pressed to not tap a toe in time or plan on buying the film's soundtrack as the songs are frequently infectious while avoiding being cloying to most musical tastes. With all the relationships, not everything is as it seems which is somewhat refreshing. CeeLo Green as the marvellously named Troublegum, a musician discovered by Dan, steals all of his scenes and is a particular highlight in the film. Sly humour is derided from Levine Dave's facial hair and album covers while the real life front man delivers a great turn in his feature film debut. Knightley and Ruffalo have a delightfully vintage ruffled chemistry though perhaps one night time playlist stroll could have lost a few minutes in the edit without disturbing the film. Often funny and frequently heartfelt, the film may not live up to the bitter/sweet romance lightening in a bottle effect of Once, but it does manage to lighten the heart and/or at least tug at one's heart strings and desire to sing along. Really ended up enjoying this. It's definitely no Once, but we can't really expect it to be.